Are you interested in a career in the fire service? 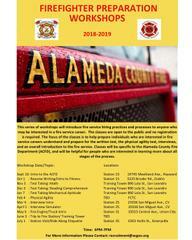 Attend a free monthly firefighter preparation workshop on Monday, November 5, 2018 from 6PM-7PM at the Alameda County Fire Department Training Tower (890 Lola Street, San Leandro) to receive an overview of the Firefighter Candidate Testing Center (FCTC) and learn more about test taking. The workshop is open to the public and no registration is required.